Last year, a Mayan elder named Carlos Barrios interviewed over 600 other senior Mayan elders to get the clearest possible understanding of the situation. “Anthropologists visit the temple sites and read the inscriptions and make up stories about the Maya, but they do not read the signs correctly. It’s just their imagination. 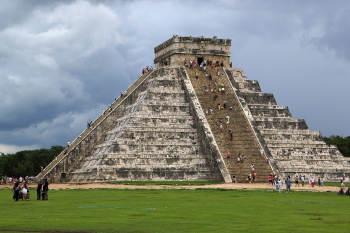 Other people write about prophecy in the name of the Maya. They say that the world will end in December 2012. The Mayan elders are angry with this. The world will not end. It will be transformed. We are no longer in the World of the Fourth Sun, but we are not yet in the World of the Fifth Sun. This is the time in-between, the time of transition. As we pass through transition there is a colossal, global convergence of environmental destruction, social chaos, war, and ongoing Earth Changes. As the Mayans believe, and as many modern researchers also believe, the human species has already went through many different changes during their history on the planet earth. Those changes have many times been difficult, but have also been followed by rapid leaps in understanding, compassion and social advancement. “The doomsday theory is unlikely and overused by power hungry governments that wish to keep their populations in fear. As we have seen quite recently in the past decade in the United States, the establishment constantly uses fear to manipulate the minds of US citizens. This technique is not new either, it has been used for centuries whether it be the fear of economic collapse, natural disaster, the enemy, or the fear of god, fear has been used by the few to dominate the many for ages. When the Spaniards were conquering the Mayan empire they learned through missionaries that 1698 was the end of the Mayan time cycle. So the Spanish waited until 1698 to invade and the Mayans took it as a sign and fled without resistance. One of the most celebrated of all doomsday predictions was made by astrologers who predicted a great flood that would end the world on February 20 1524 based on the conjunction of all the planets in the heavens mercury, Venus, Mars Jupiter and Saturn. The end of the world has been predicted many times and has yet to come, the last time that this kind of hysteria swept the world was just over a decade ago, around the change of the millennium with the y2k scare. The world didn’t end last time, and it is not going to end next time.However, there may be some truth that we are on the verge of some sort of societal transition, looking around the world all of the signs are certainly there. However, there it is not likely that the government tourist agency and the ministry will change their course. J.G. Vibes is the author of an 87 chapter counter culture textbook called Alchemy of the Modern Renaissance and host of a show called Voluntary Hippie Radio. He is also an artist with an established record label and event promotion company that hosts politically charged electronic dance music events. You can keep up with his work, which includes free podcasts, free e-books & free audiobooks at his website www.aotmr.com. If you have any questions or disagreements feel free to email him at jgvibes@aotmr.com.